The background to Basil D’Oliveira’s story is well known. He was a Cape Coloured and a cricketer who carried all before him in non-white South African cricket in the 1950’s. He rapidly reached the top of the game he was permitted to play in but, the apartheid laws preventing any possibility of a First Class career let alone an International one, he was barely known outside his own community. It was some time in 1959 that D’Oliveira started writing to John Arlott, desperately seeking help to find a job in cricket in England. Much of the correspondence survives and while D’Oliveira probably started his correspondence with little real optimism, he had chosen the right man to approach. Arlott rattled cages, and probably sabres as well, and with assistance from a number of sources D’Oliveira came to England in 1960 to take up a professional contract with Middleton of the Central Lancashire League. By 1965, a five year residential qualification completed, he made his First Class debut for Worcestershire. He had an outstanding season for the Midland County as they retained the County Championship and, by 1966, he was playing Test cricket for England against the West Indies. The Australians were in England in 1968 but by then D’Oliveira had lost his Test place. He did not enjoy a particularly good tour of the West Indies in 1967/68, the perception of the MCC management being that he had partied a little too hard, and he was dropped after England’s defeat in the first Ashes Test. Despite what would appear to be a perfectly sound case on purely cricketing grounds there were many who felt he had been dropped for political reasons. As far back as January 1967 the Labour Sports Minister, Denis Howell, had told an exultant House of Commons that the 1968/69 trip to South Africa would not take place if there were any moves to ban him. At the same time as Howell was making his speech in the Commons the South African Minister of the Interior, Piet Le Roux, had said We will not allow mixed teams to play against our white teams over here. If this player is chosen, he would not be allowed to come here. Our policy is well known here and overseas. It was cloak and dagger throughout 1968. Despite Le Roux’s words some comments of South African Prime Minister BJ Vorster seemed to indicate that D’Oliveira might be allowed into South Africa if selected. No doubt as a result of these conflicting signals, with the Ashes series in full swing, Lord Cobham, a former President of the MCC who was travelling in South Africa, was asked to visit Vorster and sound him out. He reported back to the MCC that the indication that he had received was that if D’Oliveira were selected then the tour would probably not go ahead. There were other machinations going on as some tried to persuade D’Oliveira to make himself available for selection for South Africa rather than England. Others tried to, effectively, sign him up to do something else so he would make himself unavailable for either side. He received an offer to coach in South Africa that would have seen his earnings quadrupled at a stroke. To the plotters frustration D’Oliveira declined to do or say anything that might compromise his prospects of being selected to play for his adopted country. There must have been many that hoped that with his Test place had gone any prospect of D’Oliveira being selected for the tour. He remained out of the selectors’ thoughts for the rest of the summer and his opportunity to stake a claim for a tour place seemed to have gone when he was left out of the team for the fifth and final Test. In the event however the Northamptonshire batsman, Roger Prideaux was unwell and D’Oliveira was a late call up to replace him. There was some good fortune along the way but D’Oliveira scored 158 in the England first innings and a substantial victory to square the series meant that he was right back in contention for a trip to the Cape. In the event despite a ringing endorsement from the man who was to be captain, Colin Cowdrey, D’Oliveira was not selected. In a move that reeked of indecisiveness when one of the party, Tom Cartwright, subsequently withdrew through injury D’Oliveira was then selected. Taken at face value this move simply did not make sense. D’Oliveira was a front line batsman and occasionally effective medium pace bowler whereas Cartwright was the precise opposite. With D’Oliveira selected the 1968/69 tour was indeed doomed. The South African Government refused to admit him to the country. Equally the MCC refused to be dictated to on matters of team selection and that was that. The next flashpoint was to be the next South African visit to England which was scheduled for the summer of 1970. Peter Hain was, like D’Oliveira, an African. Kenyan born he spent his childhood in South Africa where his parents, anti-apartheid activists, were harried constantly by the authorities. As a result of the harassment, which included a brief period of imprisonment, the Hain family moved to London while D’Oliveira was making his Test debut. Unlike D’Oliveira Hain was white and, perhaps more relevantly, was the political animal that D’Oliveira most certainly was not. Hain became the vociferous chairman of the “Stop The Seventy Tour” campaign whose efforts doubtless contributed, although probably not as much as they would like to believe, to the eventual abandonment of the tour. The cancellation marked the beginning of South Africa’s exclusion from all international sport until apartheid was dismantled. Hain was deeply critical of D’Oliveira, viewing his willingness to tour as a tacit approval of apartheid. D’Oliveira did not see it that way. He saw himself as what he was, a professional cricketer who simply wanted to represent his adopted country, and he believed that a gesture such as that Hain would have him make would, in any event, be nothing more than his practicing apartheid in reverse. In reality of course, had he followed Hain’s advice, then the 1968/69 tour would certainly have taken place, and very possibly it would not have been the last. So instead of visiting the country of his birth in 1968/69 D’Oliveira went to Pakistan that winter, and saw politics and sport clashing in a different context. 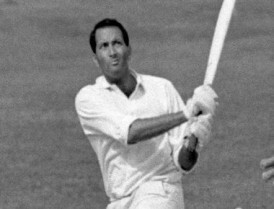 He played against a Rest of the World XI in 1970 in five “Test” matches and left the Test arena after the 1972 Ashes series, by which time he was nearly 41. Who knows what D’Oliveira might have achieved had he not started his Test career at an age when most players are contemplating retirement. As it was in 44 Tests his stylish batting brought him almost 2,500 runs at fractionally over 40, and his seemingly innocuous little dobbers took 47 wickets at less than 40. Those figures would be better still if the now disregarded matches against that immensely strong Rest of the World XI still had Test status. D’Oliveira carried on playing for Worcestershire for some years, his final First Class appearance being as late as 1980, before going on to be a greatly respected coach there. His declining years were marred by Parkinson’s disease but he saw his son, Damian, enjoy a successful county career. Damian’s son, 19 year old Brett, who shares his grandfather’s initials, made it three successive generations in the county side when he made his debut for Worcestershire in 2011. Peter Hain, once the archetypal angry young man, has forged a successful political career and was a minister in both the Blair and Brown cabinets. In 1972, when such was the fashion for those who trade in terror, he received a letter bomb. Thankfully it had been incompetently put together and failed to explode. Four years later he was tried and acquitted of an armed robbery that took place in 1974. It is widely believed he was framed by the South African Bureau of State Security (BOSS). D’Oliveira was right at the eye of the storm. Hain, with the greatest of respect to him, was a gobby teenager who was no more than a nuisance to Vorster’s government. What could have become of Dolly had he conducted himself differently? What dark threats might he have received in those difficult and stressful days? It is frightening to imagine, and there is no doubt in my mind that there are parts of the D’Oliveira story that never have been and now, following his death yesterday at the age of 80, never will be told. But to my mind that serves only to underline the respect due to a man who, despite the enormous unfamiliar pressures heaped upon him, maintained the same quiet and unruffled dignity throughout his long life. Well done – a really well written piece, imo. Great piece and a great headline too. I’m all about the show tunes references, me. Very impressive on the cricinfo mention Martin.